Join the Irish Network Bay Area for the inaugural Women in Leadership Series at Google San Francisco on Friday, April 24th from 3-5pm. This event will feature Wicklow native and NUIG graduate Anne-Marie Farrell, Head of Behavioral Economics Research, Global SMB Marketing at Google in conversation with Máire P. Walsh, INBA Board Member and Digital Strategy Director at Subdirect. Anne-Marie will share her journey, research and marketing insights, and tips for career success. The talk will be followed by networking and happy hour. Anne-Marie is a is a behavioral researcher and data-driven marketer. Anne-Marie wears two hats in Google Marketing, leading the Irrational Lab team and Onboarding for new advertisers. Irrational Lab is transforming Google’s product and marketing strategy by applying the principles of behavioral economics to combine the art and science of marketing. Anne-Marie works with marketers and product managers from teams across Google including SMB Marketing, Ads, Billing & Google[x]. Anne-Marie previously lead customer marketing for Google’s SMB global agency program. 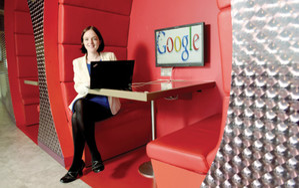 She joined the finance team in Google Dublin after starting her career as a management consultant in Accenture. A graduate of Electronic and Computer Engineer, Anne-Marie has seen irrational from code to copy. Máire is the Digital Strategy Director at Subdirect, a company that collaborates with the world’s leading publishers to build, engage, and monetize their audiences globally. Máire has worked with over 100 leading magazine, content properties, and apps building and monetizing audiences and is passionate about content distribution, audience engagement, and new publishing platforms. In addition, Máire is a Lead Digital Media Instructor for kdmcBerkeley at the UC Berkeley Graduate School of Journalism.